The Malem Ultimate Bedside Alarm with Pad is a unique and innovative bed-side device for kids who do not like the alarm version. This new type of alarm has a broad range of options that can awaken even the most deeply-sleeping kids. The enuresis alarm has a plastic embossed moisture-sense pad for the bed, which is positioned beneath the child. When the strips of the pads sensor detect any moisture, the alarm goes off. The pad needs to be positioned either inside a pillow case or under a bed sheet. The reviews below are a sample of what parents that have bought the Malem Ultimate Bedside Alarm experience. You can read more reviews on Amazon. 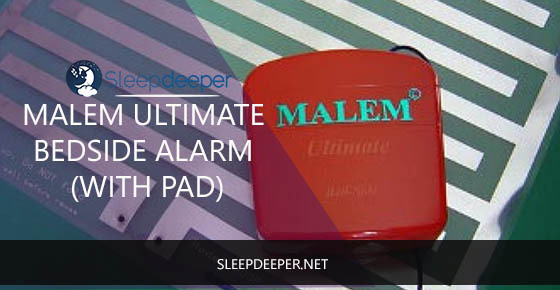 One reviewer who has a developmentally delayed and autistic daughter purchased the Malem Bed-Side Bedwetting Alarm with Pad for her since she was bedwetting and going back to sleep. The customer wanted her daughter to wake up whenever she wet the bed. This device worked perfectly for the customer. 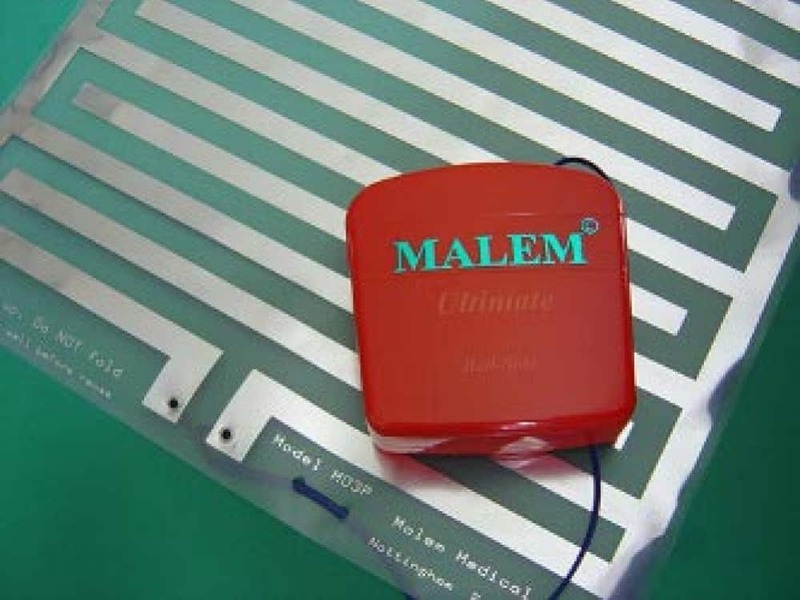 By using the Malem Bedwetting alarm, her daughter has been dry for the past four months. In recent days, she even wakes up to go to the bathroom herself!The pad makes soft sounds when the child moves around in the bed. However, these sounds do not interfere with her sleep the way the alarm does. Another reviewer feels that more than any other bed wetting alarms for kids in the market today, the Malem Bed-Side Bedwetting Alarm with Pad has more options. With the alarm, you can select the sound you prefer or even record your own! You don’t really need to buy an expensive alarm as this one does the job you need it to. 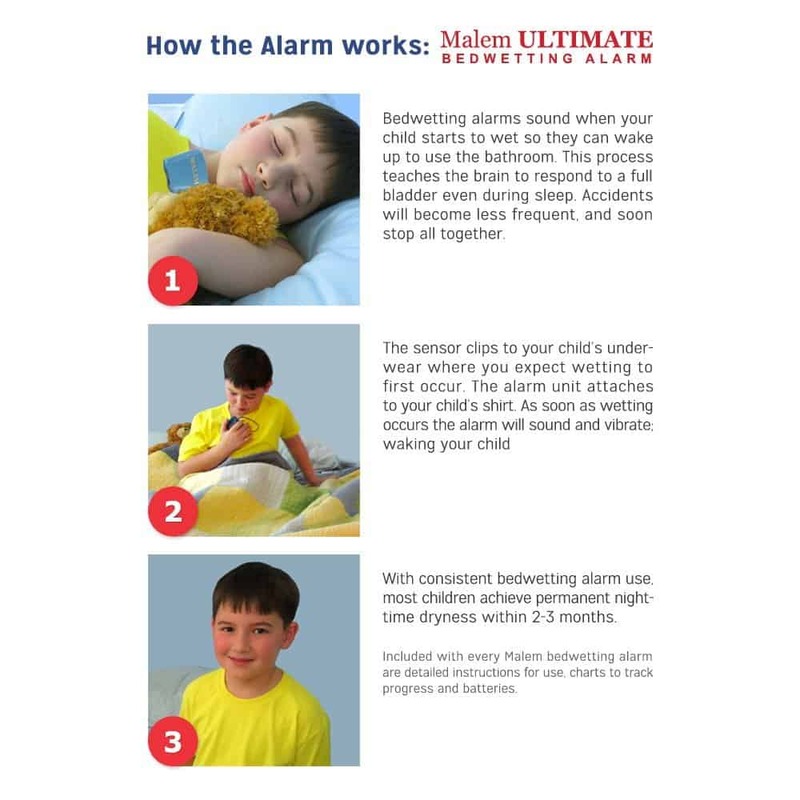 Should You Buy the Malem Ultimate Bedwetting Alarm? If you have kids with enuresis, you are probably frustrated and wondering how they can stop the habit. There are a number of bedwetting alarms for kids that you can go for. We have reviewed the best bedwetting alarms you can buy. 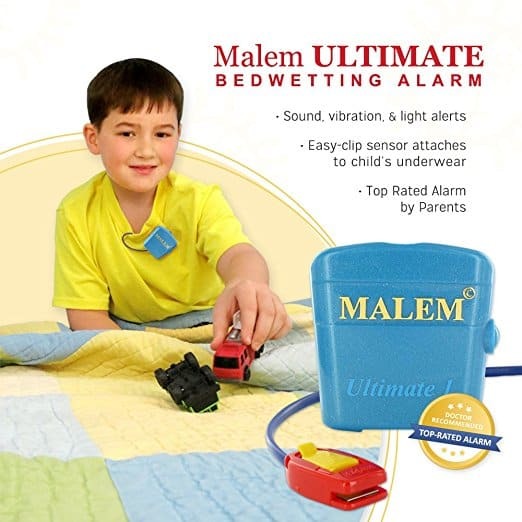 The Malem Ultimate Bedside Bedwetting Alarm is perfect if your children do not like wearing other bedwetting alarms. Moreover, the multiple alarm sound options as well as the ability to record your own sounds gives it an edge over the competition.However, its current price may be a little higher if you are looking for a cheap bedwetting alarm. The Malem Ultimate Gold Tone Bedwetting Alarm is a gadget that combines vibration and sound all in one gorgeous looking gadget. In this gadget you will find a combination of vibration, sound and light which will be sure to awaken even people who are known to sleep very deeply. Lightweight and compact, the Malem Ultimate Bedwetting Alarm with Vibration Gold 8 Tone weights just two ounces and measures two inches square. One of the most popular bed wetting alarms in the market today, the Malem Ultimate Bedwetting Alarm with Vibration Gold 8 Tone also features a sensor that clips on easily to attach directly to close-fitted underwear. You can select between just one single tone or eight various tones or even eight random tones. This gadget weighs just two ounces including the two triple-A batteries it needs to work. With all the advantages and features of world famous Malem alarms, you can get eight random tone from this gold tone version. The way this gadget works is that the alarm connects to a tiny sensor in the clip-on and is anchored outside the underwear of your child. This means no sewing is needed. Also, sweating or contact with skin will not cause the alarm to sound. The alarm keeps alarming until the sensor gets removed, which gives eight yourself or your child ample time to respond effectively to the alarm. In addition, all you need to do is clean the sensor using water with mild soap and a small toothbrush once a week to remove the residue of your childs urine. We have found the best price for Malem Ultimate Gold Tone Bedwetting Alarm at Amazon click here to check it out. One reviewer said that they have tried many different methods of trying to stop their daughter’s bed wetting habit and it turns out that only the Malem Ultimate Bedwetting Alarm with Vibration Gold 8 Tone worked. They find this to be the best combination of vibration and sound alarm. A bit larger than other Malem alarms, this reviewer thinks that the fact that you get different alarms from the different Malem colors is a great feature. Just remember that your child may need assistance in the first couple of days to wake up when they wet the bed. Another reviewer said that this alarm worked for her son as well. Even if his son was able to tune out the alarm sound, the fact that this little gadget had more than one sound to choose from really made it an effective alarm for his son to wake up. People who are skeptical but have tried everything else to no avail may that this gadget is a hoax like I did, until we actually tried it on our son and found it to really work. All you have been looking for in a bedwetting alarm is now available in 1 handy gadget: the Malem Ultimate Selectable Bedwetting Alarm With Vibration. This bedwetting alarm combines sound, vibration and light to help even the deepest sleepers awaken. An adjustable switch can be set to either just sound, vibrate or sound an alarm. The bedwetting alarm features allow you select between one sound or eight various tones. When you set the 8 tones, one tone becomes activated every time you trigger the alarm. This helps to prevent accommodating of the audio. With the other tone setting, you can select the sound you would like to hear whenever the alarm is triggered. The alarm connects to the sensor that clips on and detects if there is any moisture in the bed. The sensor, which is named “Easy Clip”, anchors outside any tight-fitting underwear for both both girls and boys. There is no need to sew anything nor any hassle with metal snaps or clips which could possibly be undone in the middle of the night. Unlike some bedwetting alarm products in the market, you do not need to attach or purchase any mini pads. The sensor contacts are inside the clip. Any sweat or skin contact will not set the alarm off. The Malem Ultimate Selectable Bedwetting Alarm uses triple A batteries. These batteries last ten times more than the standard button-type batteries used in most bed-wetting alarms. The alarm is available in magenta and royal blue colors. When shopping for the product on Amazon, you simply need to choose the color you would like. The alarm combines vibration, sound and light to help wake deep sleepers. Clinically proven equipment in effectively stopping bedwetting. There are many positive reviews of the Malem bedwetting alarm on Amazon. You can read the reviews here. Below is an overview of the reviews of Malem Ultimate bedwetting alarm. One customer was quite a skeptic regarding the effectiveness of the Malem Ultimate Selectable Bedwetting Alarm with Vibration-Camouflage. On the other hand, his son convinced him to purchase it and wore it each night for six weeks. This reviewer followed the directions on the product and his son stopped wetting the bed after two weeks. This proves that the product is effective. The customer stopped by Amazon to recommend the Malem Ultimate Selectable Bedwetting Alarm with Vibration-Camouflage for everyone who has a child that needs to stop wetting the bed! Another customer heard about this product after it was recommended by the pediatrician to help monitor this five-year-old’s bed-wetting habit. While the customer thought it wouldn’t work, she was surprised that after a month of using the Malem Ultimate Selectable Bedwetting, her son no longer wets the bed. According to the customer, the cost of the product is absolutely worth it since his son stopped bed wetting seemingly forever. The customer now recommends this bed wetting gadget for any child that has a problem wetting the bed. Check more reviews here. We have found the best price for Malem Ultimate Selectable Bedwetting Alarm at Amazon click here to check it out.